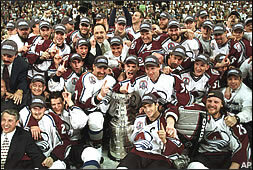 After a grueling 7 game series, the Colorado Avalanche took home the 2000-2001 Stanley Cup, defeating New Jersey. The seventh game of the Stanley Cup Final is like getting the perfect Christmas present: It seems like the big day takes forever to get there, but when it does, it's well worth the wait. Of course, Christmas comes once every year. A final-round series that goes the maximum seven games comes along a lot less frequently -- although we're in the midst of an unprecedented Game 7 boom. Since the NHL expanded from the Original Six teams in 1967, the championship round has gone the distance just seven times -- though four of those have come in the past five playoff years, including the last three in a row. If the Final is really the NHL's two best teams facing off for the championship, it seems logical that there would be more than seven to-the-limit Finals in a span of nearly 40 years. After all, baseball's World Series has gone the distance 14 times in the same span. But baseball has just eight teams in the postseason and only two rounds of playoffs before the World Series, so there's a much smaller likelihood of upsets in the early rounds. In contrast, with three rounds and potentially 21 games to play just to get to the Final, at least one team often is worn out from the journey. "Just getting to the Final is a grueling trip," says now-retired New Jersey Devils defenseman Ken Daneyko, whose team lost its bid to repeat as champions in 2001 in a seven-game Final against Colorado, but who went out a winner two years later when the Devils outlasted the Mighty Ducks of Anaheim in 2003. "You've got to win three seven-game series just to get there, and there are a lot of Game 7s within the conference. By the time you get to the Stanley Cup Final, one of the teams is often worn down. The other team often has a little more juice left in the tank than the other. That's why the Final usually doesn't go to seven games." Upsets often are the order of the day in the early rounds, where a team that hasn't had a good regular season can atone for six months of struggles with two weeks of brilliance; conversely, regular-season success means nothing in the postseason except the chance to open at home and play a seventh game in your own building. "Very often, you get an unexpected team against an 'expected' team in the finals," says Neil Smith, whose 1994 New York Rangers had to go seven games in the Final before beating Vancouver and ending their 54-year championship drought. "A lot of times, through attrition, or injuries, or a bad bounce, one of the favorites will get knocked out early. That leaves one clear-cut favorite, and that team usually wins in short order." Of the six Finals that have gone the distance since expansion, only two (1987 and 2001) have matched the regular-season conference champs. Two others matched one conference winner with a second- or third-place finisher from the other conference, while the Devils, second in the East in 2003, met the surprising Mighty Ducks, who finished seventh overall, but upset Detroit and Dallas on the way to the Final. The 2006 Final matched eventual winner Carolina, the No. 2 team in the East, with the Edmonton Oilers, who finished eighth in the West, but upset three higher seeds to get to the Final. "There should be more," says Ron Hextall, whose goaltending carried the 1987 Philadelphia Flyers to the limit against Edmonton before the Oilers won the Cup, "In theory, you've got the best teams in the sport. It's the pinnacle of the game. I wish there were more."